Bluebird Gardens handmade quilts, handmade quilts for sale, ready to ship quilts, crib quilts, baby quilts, vintage quilts, lap quilts, throws, quilted wall hangings. There are few things one can stretch on a bed, or toss over a chair, to suggest warmth, comfort and home - well, besides a cat - than quilts. Our handmade quilts are not only practical but they also reflect the thought, and artistry, that goes into making these once traditional bed coverings that still honor special occasions - births, weddings, graduations, just because. Quilts are bedding; our handmade quilts are gifts of love. Made in Missouri, USA Butterfly Garden quilt. Our available handmade quilts include both modern and vintage quilts. We only feature handmade quilts we like, ones we would use in our homes or ones we ourselves give as gifts. A favorite wedding and anniversary gift is the traditional double wedding ring quilt, which we offer in a range of sizes and prices. We also have quilted wall hangings for you to make your own quilted mementos with custom embroidery, these lap quilts are versatile and are great for seasonal home decor updates. Welcome ABC Baby Quilt and Wall Hanging. Our customers love to give crib quilts and baby quilts as gifts and we agree. What baby wouldn't like to have a safety quilt with their name embroidered on it? Quilt companies have stopped making crib quilts and baby quilts because the profit margin is smaller and they take up more storage space. We have a nice selection of unique, one of a kind USA-made crib quilts and baby quilts, some paired with matching toy gifts or books. 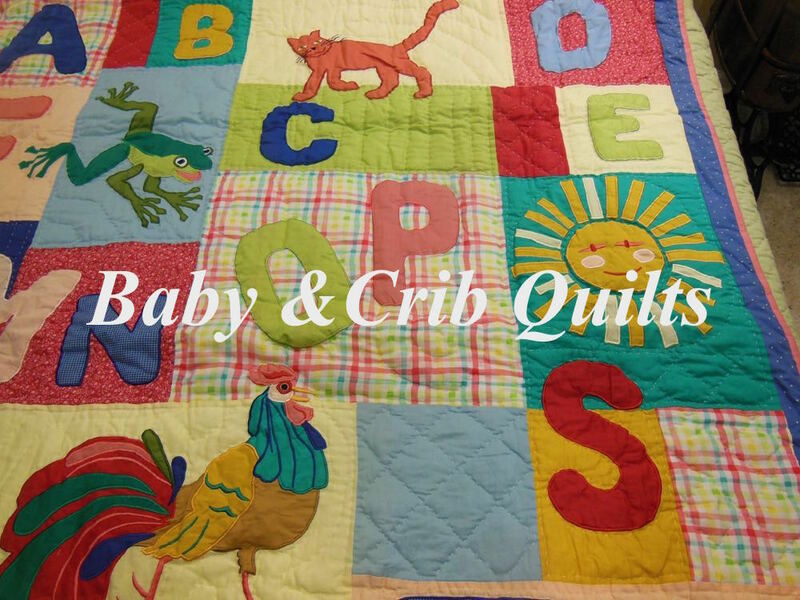 We also carry imported baby quilts for gift-giving and nursery quilted wall hangings home decor. Quilted pillows, too, easily add charm to any room, especially a baby nursery! Bluebird Gardens Pink Sleeping Cats Lap Quilt. We specialize in making custom quilts, lap quilts, pillows and quilted wall hangings in a variety of colors, sizes and designs, all selected to meet our customers gift-giving and home decor preferences. The custom quilts in this section are a starting point to show you what we have made for other customers. We also custom-make smaller quilts and lap quilts, a favorite gift idea and perfect for home decor as a quilted wall hanging. Lap quilts also easily change any room into a seasonal theme and holiday decor. Old quilts that no longer can cover a bed can be turned into bears, pillows and other decor items to preserve associated memories.